Most Widely Used Austenitic Stainless Steel, a Versatile Corrosion Resistant Alloy for General Purpose Applications. It is common practice for 304L to be dual certified as 304 and 304L. The low carbon chemistry of 304L combined with an addition of nitrogen enables 304L to meet the mechanical properties of 304. Alloy 304/304L resists atmospheric corrosion, as well as, moderately oxidizing and reducing environments. The alloy has excellent resistance to intergranular corrosion in the as-welded condition. Alloy 304/304L has excellent strength and toughness at cryogenic temperatures. Alloy 304/304L is non-magnetic in the annealed condition, but can become slightly magnetic as a result of cold working or welding. It can be easily welded and processed by standard shop fabrication practices. Alloy 304/304L has good resistance to atmospheric corrosion, foods and beverages and to many organic and inorganic chemicals in moderately oxidizing to moderately reducing environments. The high chromium content of the alloy provides resistance to oxidizing solutions such as nitric acid up to 55% weight and up to 176°F (80°C). Alloy 304/304L also resists moderately aggressive organic acids such as acetic. The nickel present in the alloy provides resistance to moderately reducing solutions such as pure phosphoric acid, whatever the concentration, in cold solutions and up to 10% diluted hot solutions. The alloy can also operate successfully in caustic solutions free of chlorides or Alloy 304/304L does not perform well in more highly reducing environments such as those containing chlorides and sulfuric acid. Alloy 304/304L performs well in fresh water service with low levels of chlorides (less than 100ppm). At higher chloride levels the grade is susceptible to crevice corrosion and pitting. For successful performance under these more severe conditions, higher molybdenum content is need such as 316/316L. Alloy 304/304L is not recommended for service in marine environments. In most instances, the corrosion resistance of Alloys 304, 304L and 304H will be roughly equal in most corrosive environments. However, in environments that are sufficiently corrosive to cause intergranular corrosion of welds and heat-affected zones Alloy 304L should be used because of its low carbon content. Nickel 8.0 min.-10.5 max. 8.0 min.-12.0 max. 0.2% Offset Yield Strength, ksi 42 30 min. 25 min. Ultimate Tensile Strength, ksi 87 75 min. 70 min. Elongation in 2 inches, % 58 40 min. 40 min. Hardness, Rockwell B 82 92 max. 92 max. Alloy 304/304L can be easily welded and processed by standard shop fabrication practices. Alloy 304/304L is subject to work hardening during deformation and is subject to chip breaking. 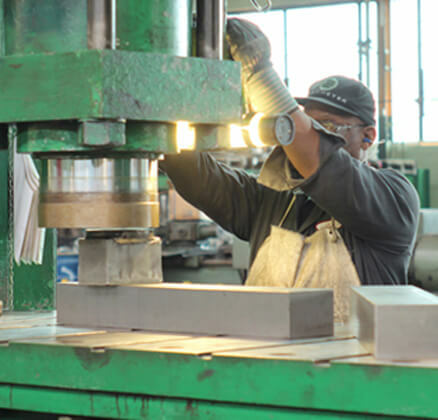 The best machining results are achieved with slower speeds, heavier feeds, excellent lubrication, sharp tooling and powerful rigid equipment. Alloy 304/304L can be readily welded by most standard processes. A post weld heat treatment is not necessary.